There are many economic adversities, frustrations, and difficulties normal to a career of farming and yet the Gibson's like most farmers, farm for love. They love the great outdoors; to work where they live and live where they work. It takes a lot of things to be a farmer; like hard work and determination to see a crop succeed, but the most important quality seems to be love. This deep routed love is what keeps a farmer farming through years of drought, hail storms, and tornadic winds trying to destroy his crop. 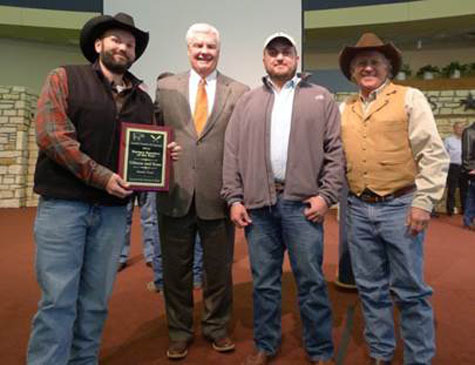 Lee Gibson along with his sons; Braden Gibson and Brett Gibson of Moore County received Amarillo Chamber of Commerce 2014 Farmer Rancher of the Year Award at the Ag Appreciation Luncheon held December 3, 2014 during the Farm Show. 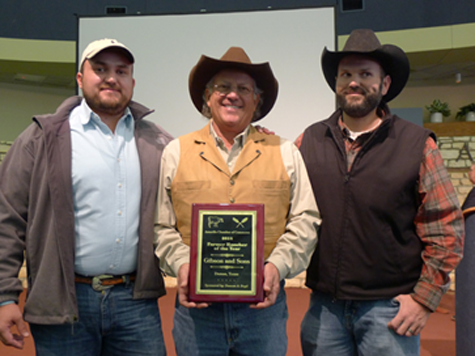 The award was sponsored by Duncan & Boyd Jewelers of Amarillo. Lee Gibson moved to Moore County in 1978 when he Married Paula Beauchamp. He then started farming and ranching alongside her father, Carl Beauchamp. Today, he farms together with his two sons Braden and Brett, both fifth generation farmers. The Gibson's agri-business operation has undergone substantial growth over the past several years; they have expanded their farming operation from Moore county to Lipscomb county, and together they now manage 3,278 acres of corn, 435 acres of cotton, 820 acres of irrigated wheat, 1015 acres of dry land wheat, 505 acres of seed milo, 213 acres of triticale seed, and 690 acres of commercial milo. In college, Lee earned a Master of Science degree from West Texas A&M University, and later put his knowledge to good use. In 1991, he began composting cattle manure for use on his own farm land, and with the help of his sons this operation has since grown into a successful company not only in Moore County, but across the Texas and Oklahoma Panhandles. Nature's Way Compost provides a cost effective, environmentally sound way for feed yards to dispose of cattle manure. As well as for farmers to get the highest quality natural product for improving soil fertility and soil physical properties. However, Lee is not just a farmer. He is a loving husband of thirty seven years to Paula Gibson, a father of three to Braden, Brett and Katie, as well as PawPa to his grandson Cutler. He most enjoys playing with his grandson, checking cattle on the ranch, and flying. He is working to obtain his pilot’s license and recently soloed. Lee has many different passions including travel, cooking, riding his Harleys, snow skiing, leather work, and photography. Throughout his years in Moore County, Lee has served on numerous boards like: the Dumas Independent School District Board, the Livestock Association Board, the First United Methodist Church Board of Trustees, the Economic Development Board, and the YMCA Board. He is currently serving on the Soil & Water Conservation District board, the Farm Bureau Board and has completed the Master Marketing program as well as the Texas Farm Bureau AgLead Program. Lee continues to be an active member of the Lion's Club, Chamber of Commerce, and the First United Methodist Church. In 2013 he received the honorary FFA Chapter Member award. In 2004, Braden earned a Bachelor of Science degree from Texas Tech University. After returning home in 2007, Braden joined his parents as a partner in their agriculture businesses. Since then he has played a significant role in expanding their small family business into the larger operation it is today. He is a loving husband of six years to Audrey Gibson and father to three year old Cutler Lee Gibson. He most enjoys playing with his son, riding his horses, working cattle, and riding his Harley. He has several different hobbies including travel, cooking, snow skiing, hiking and reading. Over the past couple years Braden has been passionately involved in helping out with the Moore County FFA youth and received their Top Hand award in 2012. He is currently serving on the Moore County Junior Livestock Association Scholarship Committee, the Moore County Farm Service Agency Board, and Moore County Farm Bureau Board. Braden is a member of the Moore County Texas Tech Alumni Association, Moore County Health Foundation, Texas Farm Bureau, and FirstUnited Methodist Church. Braden has completed the Executive Program for Agriculture Producers, Master Marketing Program, and is currently involved in the Farm Journal's Top Producer Executive Network. After studying Biochemistry at Texas Tech University Brett moved home in 2007 to partner with his family in their growing agriculture businesses. Since then he has been instrumental in the development of the farming operation. Brett is a member of the Texas Farm Bureau, and First United Methodist Church. He has completed the Executive Program for Agriculture Producers, Master Marketing Program, and is currently involved in the Farm Journal's Top Producer Executive Network. In his down time Brett enjoys traveling, jeeping, hunting, fishing, and scuba diving.